'Desert Solitude' OGB- (Lin Flanagan, R. 1992). Seedling 88011-1. AB, 28" (71 cm). Midseason bloom. 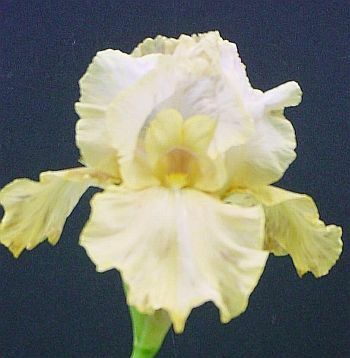 Standards white blended pale amber; Falls pale amber flushed pale violet; slightly veined red violet around yellow beards; ruffled; slight fragrance. 'Silent Dawn' X 'New Moon'. Aril Society, 1993.